Please refer to our stock # CQ-1 when inquiring. Framed Woodblock print by Kyoto artist Clifton Karhu (1927 - 2007.) "Takasegawa Spring." An image of the Takase River, a canal that runs along Kiyamachi Street in Central Kyoto. 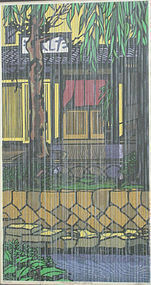 This print uses not only Karhu's well-known strong black key lines, as well as the masterful use of woodgrain; it also uses detailed technique to illustrate rain in the foreground. Signed and dated, 1990, #46 of edition on 100. Image size: H.22.25" (56.5cm) x W.11.75"(30cm. ), Frame size: H.29.25" (74cm) x W.18.5" (47cm) x D. 11/16" (1.75cm.) Original frame from Tolman Gallery in Tokyo, Karhu's most influential supporter and promoter. Both print and frame are in very good condition. Clifton Karhu was born in Duluth, Minnesota in 1927. His early experience in Japan was as an American soldier, stationed at Sasebo from 1946 to 1948; then later as a missionary for the Lutheran Church from 1952 to 1958. In between, back home in the U.S., he attended the Minneapolis School of Art from 1950 to 1952. His home has long been Japan, specifically Kyoto, where he lived since 1963. After leaving missionary work and returning to the arts in 1958, he painted and sketched while living in Gifu Prefecture and had his first exhibition there in 1961. Woodblock printing has been his mainstay since moving to Kyoto, where he has built a strong reputation in the Japanese art community. He has also exhibited widely throughout Japan, the U.S. and Europe. He enjoys somewhat of a celebrity status in Kyoto, where he often described as “more Japanese than a Japanese,” often seen wearing kimono and living the life of a traditional Japanese artist. Inspiration for his works often come from his immediate surroundings, showing local architecture and landscapes; old houses, streets, temples, and the like. Considerable biographical and exhibit information is available on the web and a recent retrospective of his work, “Karhu @ 77: A Tribute" was published by Norman Tolman of the Tolman Collection in Tokyo, who has long been a leading representative of Karhu’s work in Japan. His recent passing on March 24, 2007 was a great loss to the Japanese print world. A fine obituary can be found in the Minneapolis-St. Paul Star Tribune in his birth state of Minnesota. A link can be provided on request.